One of the missions of the Deschutes County Search and Rescue Foundation is community outreach to increase public awareness of the Search and Rescue organization and to educate the general public on wilderness safety. To support this mission, the Foundation maintains a Speakers Bureau to work with local schools, organizations and companies to provide speakers to address a wide range of topics on the above subjects. Provide information on winter survival skills and the 10 Essentials. 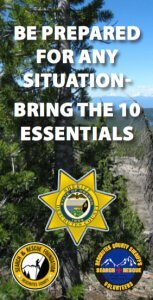 Provide information on how to stay safe in the wilderness and demonstrate simple wilderness survival skills. Provide information on the Search and Rescue organization and showed video with testimonials from several rescue missions. Provided an overview of Search and Rescue to high school students and basic winter survival skills. Provided information on search and rescue activities using the SAR K9 team with dog demonstrations. Host booth at the Vendor Village as part of the Subaru Outside Games and provide information and literature on Search and Rescue organization. Provide search and rescue demonstration with the SAR K9 team for elementary aged school children. Provide information on Search and Rescue organization to OYCP students as part of their Fall Career Fair. Provide information to BPA linemen on safety while working in winter conditions. Provide information on the Search and Rescue organization and wilderness safety to children and adults. Provide overview of the Search and Rescue organization and showed video with testimonials from several rescue missions. Provide overview of the Search and Rescue organization. Provide overview of the Search and Rescue organization to seven different groups of middle school children. Provide overview of the Search and Rescue organization to elderly patients struggling with early stages of Alzheimer’s disease.